Today, the number of people on the move is unprecedented, with international tourist arrivals increasing from just 25 million in the 1950s to 1.2 billion in 2016. Historically, travel was a luxury, but thanks to lower barriers to travel and falling costs, it is now within the reach of millions. These factors, combined with the growth of disposable income, the rise of the middle class in many emerging markets, and changing attitudes towards travel, have enabled the industry to flourish. The global middle class is forecast to grow by a further 3 billion people between 2011 and 2031, the majority of whom will come from emerging markets, with China and India leading the way. While travel is already booming in China, it is estimated that only 4% of Chinese nationals have passports. Similar trends are apparent in other emerging markets. What is clear is that these new travellers, like millennials and baby boomers before them, are looking for experiences. In previous decades, North America and Europe dominated travel markets, but this may not be the case for much longer. By 2030 most of the growth in international travel will come from Africa, Asia and the Middle East, which will enable further growth and job opportunities in these regions. Although markets in Europe and the Americas will continue to grow, the rate is incomparable to other regions. In fact, since the global financial crisis, tourist expenditure from developing countries has grown faster than from advanced economies – a trend that is on track to continue. In the past, the majority of travel was north to north, but this reality is changing. Outbound travel from Africa, the Middle East and Asia-Pacific is expected to grow exponentially in the coming decade. Developing and emerging markets are not only becoming larger source markets, but are also improving their own travel and tourism offers to position themselves as more attractive destinations, thus helping their industries develop further. Why should countries continue to enhance their travel and tourism competitiveness? Because the pie continues to get bigger. More people are travelling than ever before, with international arrivals expected to reach 1.8 billion by 2030. 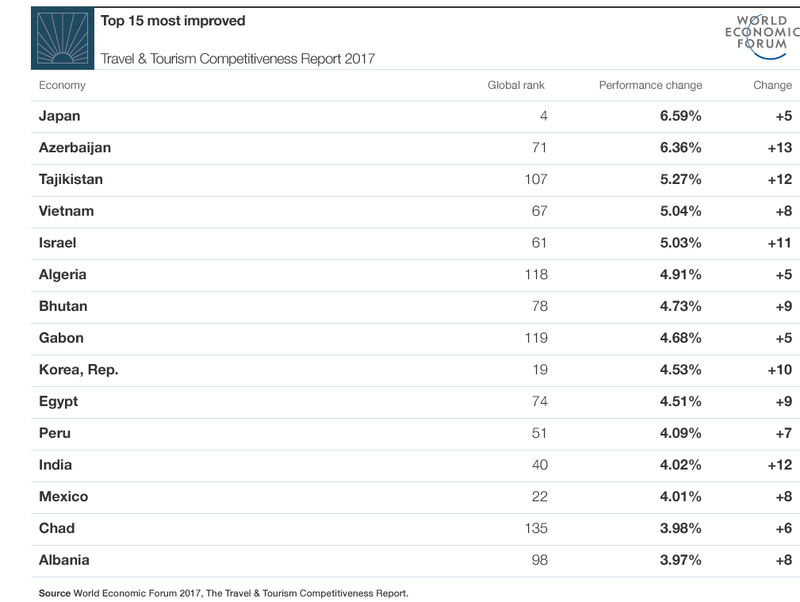 In the 2017 edition of the Travel and Tourism Competitiveness Report, we found that 12 of the top 15 most-improved countries are from developing and emerging markets, with at least one country from each geographical region featuring. These results are supported by World Travel and Tourism Council (WTTC) research, which suggests that between 2016 and 2026, the top 10 fastest-growing destinations for leisure travel spending are expected to be India, followed by Angola, Uganda, Brunei, Thailand, China, Myanmar, Oman, Mozambique and Vietnam. Your next trip? 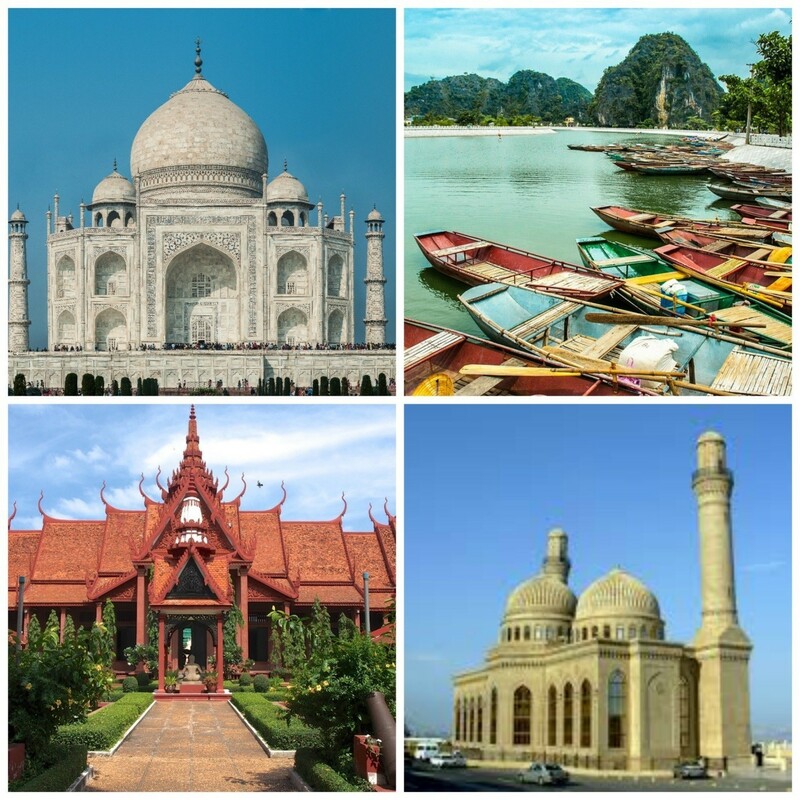 From top left: India, Vietnam, Cambodia, Azerbaijan. These shifts suggest that developing and emerging countries are catching up, providing better conditions to make their travel and tourism proposition more competitive and, therefore, becoming better prepared to attract and welcome the millions of new tourists who will travel for the first time in the coming decade. This growth in demand is here to stay. South-to-south tourism is on the rise and will continue to increase as these countries improve their competitiveness and develop their travel and tourism sectors. Read the Travel & Tourism Competitiveness Report 2017 here.